Greenhouse-gas emissions from human activities do not only cause rapid warming of the seas, but also ocean acidification at an unprecedented rate. Artificial carbon dioxide removal (CDR) from the atmosphere has been proposed to reduce both risks to marine life. A new study based on computer calculations now shows that this strategy would not work if applied too late. CDR cannot compensate for soaring business-as-usual emissions throughout the century and beyond, even if the atmospheric carbon dioxide (CO2) concentration would be restored to pre-industrial levels at some point in the future. This is due to the tremendous inertia of the ocean system. Thus, CDR cannot substitute timely emissions reductions, yet may play a role as a supporting actor in the climate drama. "Geoengineering measures are currently being debated as a kind of last resort to avoid dangerous climate change - either in the case that policymakers find no agreement to cut CO2 emissions, or to delay the transformation of our energy systems," says lead-author Sabine Mathesius from GEOMAR Helmholtz Centre for Ocean Research Kiel and the Potsdam Institute for Climate Impact Research (PIK). "However, looking at the oceans we see that this approach carries great risks." In scenarios of timely emissions reductions, artificially removing CO2 can complement efforts. "Yet in a business-as-usual scenario of unabated emissions, even if the CO2 in the atmosphere would later on be reduced to the preindustrial concentration, the acidity in the oceans could still be more than four times higher than the preindustrial level," says Mathesius. "It would take many centuries to get back into balance with the atmosphere." About one fourth of the CO2 produced by humans each day is being taken up by the oceans, resulting in a chemical reaction leading to a higher acid content in the water. In the long run, this can threaten marine life forms such as corals or shellfish as the acidification reduces the shell and skeleton production. This would affect biodiversity and the intricately interwoven food webs. Thus the CO2 uptake by the oceans is a danger for marine life. Therefore hopes have been placed on carbon dioxide removal measures. One option: huge amounts of biomass - for instance fast growing trees such as poplar - consuming CO2 during growth could be burnt in bioenergy plants where the CO2 gets captured and stored underground (CCS). While this technology is not yet proven at an industrial scale and would have to be carefully balanced against land needs for food production, one major intended benefit would be to preserve the oceans from acidification. "In the deep ocean, the chemical echo will reverberate for thousands of years"
"We did a computer experiment and simulated different rates of CO2 extraction from the atmosphere - one reasonable one, but also a probably unfeasible one of more than 90 billion tons per year, which is more than two times today's yearly emissions," says co-author Ken Caldeira of the Carnegie Institution for Science in Stanford, USA, who worked on this issue during a research stay at PIK. The experiment does not account for the availability of technologies for extraction and storage. "Interestingly, it turns out that after business as usual until 2150, even taking such enormous amounts of CO2 from the atmosphere wouldn't help the deep ocean that much - after the acidified water has been transported by large-scale ocean circulation to great depths, it is out of reach for many centuries, no matter how much CO2 is removed from the atmosphere." The scientists also studied the increase of temperatures and the decrease of dissolved oxygen in the sea. Oxygen is vital of course for many creatures. The warming for instance reduces ocean circulation, harming nutrient transport. Together with acidification, these changes put heavy pressure on marine life. Earlier in Earth's history, such changes have led to mass extinctions. However, the combined effect of all three factors has not yet been fully understood. "In the deep ocean, the chemical echo of this century's CO2 pollution will reverberate for thousands of years," says co-author John Schellnhuber, director of PIK. "If we do not implement emissions reductions measures in line with the 2°C target in time, we will not be able to preserve ocean life as we know it." The oceans don't need saving. 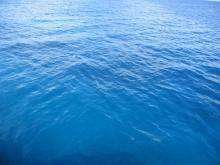 The ocean's buffering agents are measured in parts per thousand, the ocean's acidifying agents are measured in parts per billion. Call me when the carbonate shelf starts dissolving. How about the fact that volcanic eruptions release more co2 at once then all the man made co2 produced? Better tells those volcanos they are gunna have to carbon tax them right? Greenhouse-gas emissions from human activities do not only cause rapid warming of the seas, but also ocean acidification at an unprecedented rate. I'm still waiting for AGW Cult "science" to explain how warming oceans absorb more CO2. Selfish Deniers will still be screaming "Not so!!" even as the seas swallow us and the pollution chokes us to death. These global volcanic estimates are utterly dwarfed by carbon dioxide emissions from fossil fuel burning, cement production, gas flaring and land use changes; these emissions accounted for some 36,300 million metric tons of carbon dioxide in 2008, according to an international study published in the December 2009 issue of Nature Geoscience. Even if you take the highest estimate of volcanic carbon dioxide emissions, at 270 million metric tons per year, human-emitted carbon dioxide levels are more than 130 times higher than volcanic emissions." Your "fact" is a myth. I'm getting tired of the anti science trolls here. Are they paid for spamming, or just plain retarded? @antigoracle: Dissolving CO2 from additional CO2 in atmosphere is dominating the CO2 degassed by the increase in temperature. The mistake you're probably making is assuming that sea-water is already saturated with CO2. Actually the plethora of paid troll deniers at this site seems strangely depleted of late. Very weird. Probably because these forums are little-more than an insult fest. Look at the above. There are better places to spend one's lunch hour. Huckabee, July 28: He probably does, but a volcano, in one blast, will contribute more than 100 years of human activity. So when people are worried about it — you know?" There is your clue where mikedallama gets his information. "There are better places to spend one's lunch hour." Yes, these were ruined by snipers attacking others personally. So the 4% manmade CO2 is not only overwhelming the natural 97%, but is causing the oceans to absorb more CO2 than it's releasing, as it warms! Care to provide a peer-reviewed paper on how that's possible? The article describes a few things that are troubling. First, it describes models. We have seen from observation that models do not do a good job of predicting what nature will do. Second, it describes CDR, which (given the enormity of the earth's climate) can be described as an anthropocentric viewpoint, easily leading one to the perception that the entire article is written from that world view. Measurements may show the oceans acidifying, but what are the natural bounds of variability? Given the cyclic nature of the planet's climate, this should be known. Have we accounted for natural ocean cycles that raise acidic waters from deeper layers and the biological responses that pump CO2 back to ocean depths? How come prehistorical CO2 levels didn't turn the ocean into vitriol? There are still far too many things that aren't known to blame humans for what is happening, or to justify embarking on massive climate engineering. You should have been content with who you are, not with what you wanted others to believe. When you were unable to back up your claims with the appropriate behavior, you got rekked. The party's over, boys and girls. Thermodynamics is about to kick our stupid collective butts. "Measurements may show the oceans acidifying, but what are the natural bounds of variability?" We already see the negative effects. Do you have to wait until we kill the entire ocean? And if we do, you still will deny it. We already see the negative effects. Do you have to wait until we kill the entire ocean? And if we do, you still will deny it. What are the negative effects that we're already seeing? Provide references. Pointing to specific passages and summarizing/paraphrasing those passages will be very helpful. Has anyone read the abstract? Holy nonsense batman. No offense but EVERYTHING is a negative effect from the viewpoint of the AGW die-hards, most especially you who enjoys making statements like "the seas swallow us and the pollution chokes us to death." or even more recently, "Do you have to wait until we kill the entire ocean?" I know you've read the story of the little boy who cried wolf. Tone your doom frenzy down before more people tune you out. I think your seeing the effects of someone that knows enough to be dangerous, but has no clue how to articulate it. So they attempt to build a false persona, and then fall back on this credulity to do little more than post nonsense. Lets see how they perform on my request before casting that judgement in stone. And dont forget, some are clearly psychopathic. Spot on....All 3 that is, Paid in peanuts they are indeed, monkeys don't need money... their overlords know it, laughing while they pay them peanuts to be dumb on this forum. Why are you asking for references? you spend tons of time on this site and just about every day they post an article about how climate change is already negatively impacting the planet, which you then comment on saying the same bucket of crap that you always do. You see the exact same information as us, the difference is that you have the mind of a conspiracy theorist and won't accept anything that conflicts with your own personal prejudices. There is absolutely no point in showing you anything, it's like suggesting God isn't real to a priest. Unless some dramatic change in your personality happens and you are suddenly able to open your mind, you will never understand climate change because you have already decided with full conviction that it is not real. You don't read to see what people have to say, you assume they are just wrong and only sit there thinking "climatologists sure are dumb", you aren't actually thinking about anything of substance. This clown posts on every single climate article without any clue as to understanding scientific evidence... stop playing with little donglish and grow a pair of braincells. commenting utter bs on physorg is his life, i don't think he ever leaves his closet. Because there must be some for you guys to believe it so strongly. Yes. Humanity is innocent until proven guilty. Like AGW models being falsified by observations. Actually, I read everything from both sides, and USED to be an AGW person. Do you? Unfortunately, I do. All I see is insult and groundless appeal to reason. Nothing else. you aren't actually thinking about anything of substance. My substance is above, and you didn't address any of it. Look at how these people communicate. This even even got an up-vote. That should tell one all they need to know about this crowd. Actually, they don't. Most of the articles are about scenarios, models, nonsensical ideas such as Geo-engineering based on something that might happen (see above, Geo-engineering being nonsense, as is justifying such a massive endeavor on conjecture) or claims that upon closer examination of the paper, reveal that models were used to arrive at conclusions. There have been very few convincing climate articles on this site. YOU are the one who explicitly chose to not "believe" in the global scientific consensus, that means the burden of proof lies on you. I believe it because it makes perfect sense, it's the freaking carbon cycle you knob. Oil and coal are made from ancient forests, forests are made out of carbon from the atmosphere. Throw in 7 billion people burning fossil fuels in an atmosphere that is effectively only 60 miles thick and you have climate change. Glaciers are at record low levels, Antarctica is melting dramatically, oceans are becoming more acidic, ocean levels are rising at a measurable pace, and the entire climate system is getting warmer especially the Indian ocean and arctic regions. We are going to see the first summer without a northern ice cap in our lifetimes and you're acting like this is "just business as usual". that means the burden of proof lies on you. Insult and speculation. Neither go anywhere. You do know glaciers wax and wane, yes? Nothing outside the natural variations. .98 inches in the last 50 years iirc, and slowing relative to what happened as we first exited the ice age that we are still exiting. How about you talk about the actual mechanism of climate change that I outlined? You said the carbon cycle is speculation, prove it, that's the single basic scientific principal that climate change relies on. I love this argument. It's my absolute favourite. See, volcanoes emit 1% of human emissions. Just 1%. So if you concede that the amount emitted by volcanoes is sufficient to cause warming or, in this case, acidification, then you've conceded anthropogenic global warming because... 100% times more emissions!. Congratulations! You're on the side of science. They don't. There's just more for them to absorb. Duh. No one has ever claimed that the absorption rate itself has increased. No one. Just like no one ever claimed that there was "no other way climate could change other than human GHG emissions" and no one claimed the Arctic would be ice free by 2015 and no one claimed that warming would be linear. I know, but in your case it's for a brain. - also the 'decomposition rate' for organic matter will accelerate, so removing more oxygen and replacing it with more CO2 from decomposition, leading to more 'dead zones' and chemistry imbalances affecting reproduction etc. No, I said you're speculating. "Impacts of ocean acidification on marine fauna and ecosystem processes." "Northwest Oyster Die-offs Show Ocean Acidification Has Arrived"
The internet is a wonderfully informative thing, and search engines are so easy to use. I don't think you're going to get much in the way of science out of denglish. He's admitted that he doesn't understand any kind of science and that his beliefs are based on a logical fallacy. He's probably trotted out the model graph by Spencer that denglish claims falsifies the models. Even though he can't explain how it does that nor why he claims that Spencer's graph is identical to another graph that plainly shows the models haven't failed. Denglish seems to be proud of his incompetence, like it's a badge of honor to remain willfully ignorant. Lol. Good one. I could not have asked it better myself. - why are the data uncertainty and model uncertainty bands missing? - why is UAH satellite data displayed? Satellites can't measure global average surface air temperature, they measure the temperature of a much thicker layer of air. - why is only one dataset displayed for global average temperature? How and why was this dataset selected from the several that are available? Also, it's fascinating to note that the "it hasn't warmed in 18 years" brigade use the UAH data, which clearly shows that warming has occurred. Actually the rate of global sea-level rise is about 3mm/year, so sea level has risen about .98 inches in the last 8 years. Correct. The likelihood of many people here of valuing peer reviewed scientific papers over their favorite world view reinforcing website is almost nil. This is a very good question and one I've tried to get denglish to answer. This is apropos given the recent study that shows quite conclusively that model/data comparisons have pretty much all been done incorrectly (http://www.skepti...ght.html ). When comparing similar data, it turns out that the models do quite well. Still waiting for the AGW Chicken Littles, who pretend to know science, to find me a PEER REVIEWED study confirming that a warming ocean absorbs more CO2. Can no-one stay on topic? Regarding the graph, and missing uncertainty bands missing, I don't know. Perhaps they are averaged. Perhaps the graph is far to busy already without them. However, the person that presents it is a Phd in climatology, and quite level-headed on the subject of climate change and AGW, so I will trust him; especially in the light of the other predictions that haven't come true from the AGW side. Regarding sea level rise, .98 inches since 1960. Not enough to be alarmed, and seemingly well within the natural variance band. Guys, not to be rude, but none of this is on topic to the article. If we can't stay on topic, I'm going to let your comments slide by. We've been over the same thing again and again, no offense, but I don't' have the time for it.
" I'm going to let your comments slide by." What? No insulting personal attacks? No irrelevant posturing? We do not believe you. Stay away for a year or two, and prove it. PS: Spencer posted on the thread (top link) to "Sou" (Mirian O'Brien - who runs Hotwhopper) and when she blasted him he didn't come back. Yeah, I saw that too. that person was very rude to Spencer. Why should he waste his time? Also, check out the comments afterward. It seems that the revealing of Spencer's graph as false may have more holes than the author intended. So, the veracity of the graph, prepared by a level-headed, accomplished and vetted PhD stands. I don't understand the violent reaction. 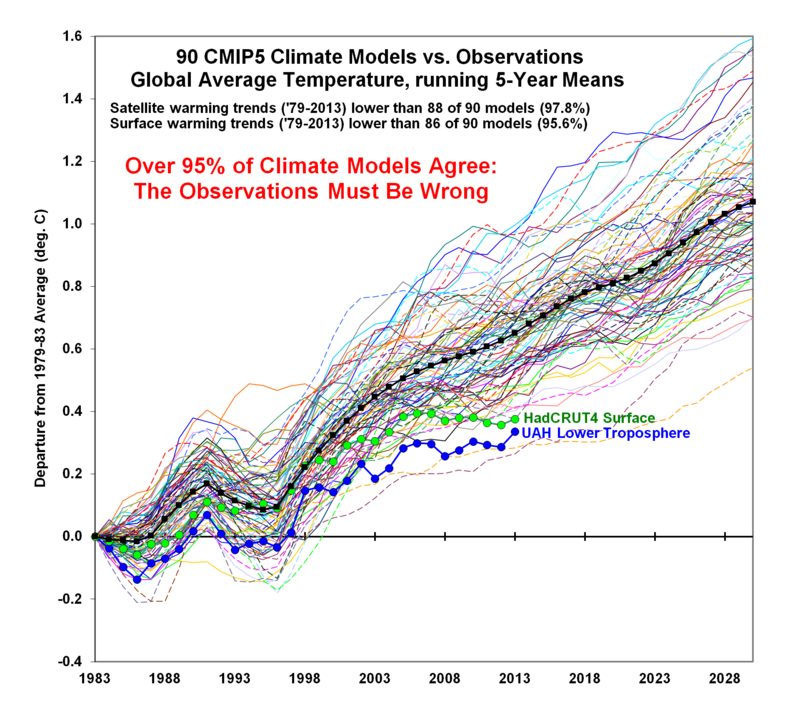 Usually, when models are falsified, one expects scientists to look closer. In this case, the response is violent attack. Revealing. Anyway, so off topic! No more tracking this POS. My comments relevant to the article are high above this one. I'm can't understand it either. He's gone to such lengths to completely misrepresent reality. Such noble efforts to fabricate and distort. Why are people so mean? 100% of the AGW Cults climate models have failed for the last 18 years. BTW that's called perfection in the AGW Cult. I'm can't understand it either.... blah....blah..
Can't blame you. It does require a brain. I pointed that out to denglish one of the first times he posted his graph. But he admitted he couldn't understand any of the science and couldn't tell if or how that graph falsified the models. He just stuck to his appeal to authority logical fallacy (which is funny given Spencer's history of errors with models). Of course, none of this addresses the problem of how any issues with the models in any way invalidates the science (since models, by definition, are incomplete implementations of the science). It's confirmation bias. Pure and simple. His ontology means he can't accept climate change is real so therefore he seeks out confirmation of that viewpoint. Unfortunately there's an entire industry devoted to providing manipulations of the data to allow people to do just that. If you look at NOAA or NASA you can clearly see a strong warming trend. Most of these "graphs" that show no warming have been deliberately manipulated to make them appear that way. The most famous of course is the "no warming since 1998" one that mysteriously still shows no warming even though temperature records are clear that 2014 is the hottest year on record. I also want a PEER REVIEWED study confirming the existence of unicorns gamboling happily under a rainbow sky. If you can't, then CLEARLY horses can't exist. Because SCIENCE. Regarding the graph, and missing uncertainty bands missing, I don't know. Perhaps they are averaged. Perhaps the graph is far to busy already without them. OK, you're well out of your depth here. The uncertainties are just as important as the measured and modelled values, and without the uncertainties, it is impossible to evaluate the effectiveness of the models. However, the person that presents it is a Phd in climatology, and quite level-headed on the subject of climate change and AGW, so I will trust him; especially in the light of the other predictions that haven't come true from the AGW side. OK so you have no rational arguments to support your beliefs. I'm fascinated by these "other predictions" - which predictions are these? Oh dear. The graph you have posted does not display total sea level rise, only the thermosteric sea level rise, that is, the component of sea-level rise that is due to the expansion of sea-water as it warms. The component of sea-level rise due to melting ice is not included in that graph! find me a PEER REVIEWED study confirming that a warming ocean absorbs more CO2. There are plenty of peer-reviewed studies showing that the oceans are absorbing CO2 e.g. And plenty showing that the oceans are warming, for example, see the thermosteric sea level graph that @denglish provides, this graph shows the sea-level rise due to thermal expansion of the oceans. Nobody has ever claimed that warming water absorbs CO2 at a greater rate. Simply that there is more CO2 for that water to absorb. Since it's clear that the rate of CO2 release from water warming is not sufficient to account for the additional CO2 it's absorbing, his point is a basic strawman. It is true, that water will reach peak saturation and stop absorbing CO2. This will be exacerbated by the CO2 released from warming water. This, of course, as anyone with any intelligence will tell you is a BAD thing since the CO2 will then increase atmospheric warming instead. 7.87 inches. Not bad considering the way they rose when we first exited the LIA. And a Lie. CO2 is much more soluble in warm water than in cold. So ocean acidification really hits the warmer shallow waters (where life grows by the way) far more than the colder polar regions. Now if you heat the polar regions, they will pop just like the hot Coke did. A Bad feedback. It's not a lie so much as a deliberate distortion. He knows that there are no peer-reviewed papers that prove that basic chemistry has radically changed. By asking for it, he's putting himself squarely in the camp of those who claim that climate change can only be happening if I can "prove" the Earth functions the same way as a greenhouse or if I can "prove" that human activity is the only possible way the climate could be changing. Thanks @leetennant. Great URL. The video is just perfect and states exactly what happens. It's kind of hard to describe when your just waving your hands trying to recite info from a high-school chem class. I have my own choice words but I could not agree more! It's not a lie so much as a deliberate distortion. He knows that there are no peer-reviewed papers that prove that basic chemistry has radically changed. You know the idiot has my sympathy and so I have refrained from responding to the garbage you spew. However, now you have taken it to the even lower level of wilful ignorance and all I can say to you is --- The Cult welcomes you. "Help! The paranoids are after me!" When the 'hockey stick' and other trend curves had to be 'reinterpreted', the credit of AGW 'scientists' slumped from zero to negatve infinity. However, I sincerely appreciate them because they keep providing so many 'data' and 'logical inferences' on which my students and I have so much fun on daily basis.